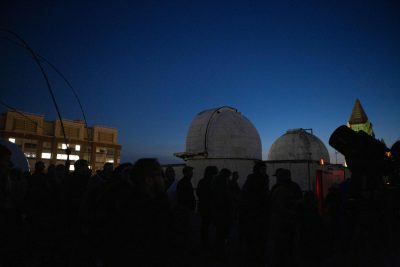 Lined up and awaiting their chance to look through the 8-inch reflector telescopes, locals and tourists alike met for Public Open Night at the Observatory on the vernal equinox on March 20. Public Open Nights at the Observatory are held free of cost every Wednesday, weather permitting, at the Judson B. Coit Observatory on the roof of Boston University’s College of Arts and Sciences. Open Night began in the mid-1970s when Jeffrey Baumgardner was the observatory curator, according to Quinn Sykes, who now holds the same position that was renamed as observatory manager. Baumgardner, who received a master’s degree from BU in 1977, is currently a senior research scientist at the BU Center for Space Physics. Graduate students studying astronomy work with Sykes to help run the event every Wednesday, he said. They help visitors view the images in the telescopes and answer questions. John Wendeborn, one of the graduate students, said he is currently researching protoplanetary disks around young stars. Sarah Mouhoubi, 32, of Montreal, Canada, said she and her brother were visiting Boston and had looked up what they could do for free and found the Public Open Nights. Elaine Martens, 49, of Boca Raton, Florida, said she was visiting Boston on a vacation and doing “all the touristy things” when she decided to attend Open Night. Not only was March 20 the official first day of spring, it was also the third and final supermoon of 2019. A supermoon occurs when the Moon is closest to Earth in its orbit, called perigee, and is simultaneously a full moon, according to National Geographic. Visitors to Open Night saw this supermoon, as well as Mars and the Orion Nebula, where some scientists believe stars are currently being formed, Sykes said to the crowd. The nebula was the farthest thing observed that night, Sykes said. He delved into light years and explained that by viewing the Orion Nebula, stargazers were looking into the past. Ana Rocha, 30, of Cambridge, said she struggled to wrap her head around the concept. “That blows my mind,” Rocha said. Girl Scouts from Boston and Newton, as well as first grade students from Baldwin Early Learning Pilot Academy in Brighton, also attended the observatory’s night. James said her students had recently learned about the solar system, and she was looking for a way for them to be able to look through telescopes. Sam Valentine, 33, of Somerville described looking at the Moon as like looking at the Grand Canyon. The observatory was built when the CAS building was built, according to Sykes. There are two telescopes in the observatory that were built in the late 1800s, but now there are also newer telescopes in domes on top of the roof, he said. They’re not research-grade, but “they’re perfect for showing students their first glimpses of Jupiter and Saturn and looking at what little nebula we can see from Boston,” he said. In 1988, Boston University began a collaboration with Lowell Observatory to jointly operate a 72-inch Perkins telescope at the observatory in Flagstaff, Arizona. Dan Clemens, chair of BU’s Astronomy Department, said the university is interested in making the telescope more accessible for student use. “Boston University and Lowell Observatory are in active negotiations to transfer the ownership of the 72-inch telescope from Lowell to Boston University,” Clemens said. Due to cancellations over unpredictable weather, Open Night was last held Jan. 9 prior to the evening on March 20. Tickets for Public Open Night at the Observatory open at 11 a.m. every Thursday for the following Wednesday and usually run out within minutes. I have had the pleasure of public star gazing at another college observatory (Rensselaer Polytechnic) hopefully someday I can do the same at BU. Thanks for an interesting article!